This is the first week of Lent for Christians. This year, consider a different type of fast. Or, if you don�t observe lent, they are good suggestions and can be used at any time of year. This program is provided by our neighbors in New England � the Massachusetts United Church of Christ. It provides good tips on energy reduction. 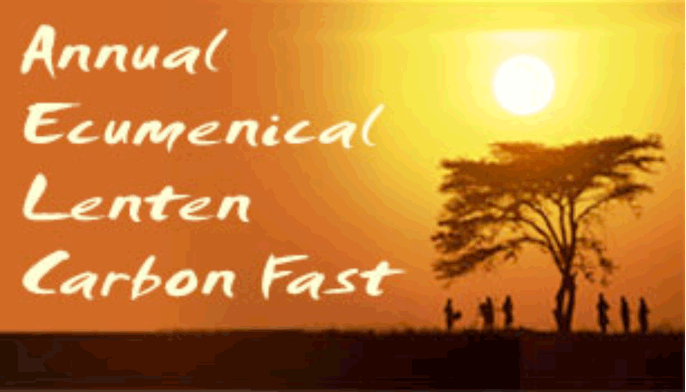 If you would like to participate, enter your email in the box near the center of their page: www.macucc.org/carbonfast. Do you have too much clutter in your house?Are your closets jammed with unused clothing? Do you have computer monitors you have been meaning to get rid of, but never do? Are your days filled with mindless activity, yet little gets accomplished? As we as a congregation prepare to celebrate Easter, we need to prepare our minds and hearts as well. Through prayer and reflection, we clear our mind to focus on the meaning of the Resurrection. To help clear our minds, it is often beneficial to clear our surroundings. �Lighten Up for Lent� calls on you to declutter your home in the spirit of service to others. Starting on Ash Wednesday, Feb. 13, and continuing through Lent, the Christian Education Committee challenges you to remove at least one item from your home each day. Some items would be thrown away or recycled; other items would be donated or sold. If you sell an item, please consider donating the proceeds to the charity or good cause of your choice. As you free your home from clutter, focus on how you spend your time each day as well. Is there a way to organize your time to spend more of it on family and friends? Could your time be better spent volunteering for community service? Try to strip the inessential uses of your time in order to spend more time on what you consider truly important. We hope that at the end of the six weeks, you will feel a sense of accomplishment that your donations have been put to good use. We hope that you will not only be rid of unused items in your home, but be rid of clutter in your mind as well, for an open, uncluttered mind is more open to the message of Easter. “Do not store up for yourselves treasures on earth, where moth and rust consume and where thieves break in and steal; but store up for yourselves treasures in heaven, where neither moth nor rust consumes and where thieves do not break in and steal.� For where your treasure is, there your heart will be also.�� Matthew 6: 19-21.